Joshua Redman is the son of legendary jazz saxophonist, Dewey Redman. He is one of a select few artists of the last two decades that has consistently made strong and compelling records (14 in all). His albums are not experimental or even far reaching into the avant garde but he does lay out a steady presence with each release that does challenge your thinking. Those familiar with Sonny Rollins will see the similarities in Redman's approach. He first gained prominence through collaborative work with guitarist Pat Matheny before branching off on his own. His first four albums (Joshua Redman, Wish, Moodswing and Spirit Of The Moment) took the jazz world by storm. People (including myself) were tripping over themselves to talk about how powerful and joyful his playing was and who went to the most live shows during that time period. Joshua Redman did deserve all the plaudits he received during the early '90s. This was the time period when jazz was having a massive resurgence through the Marsalis Family, Roy Hargrove, Christian McBride, Nicholas Payton, Russell Malone, Kenny Garrett, Benny Green, Harry Connick Jr. and more. But Joshua Redman's first few albums were probably only equaled in excitement by those from both Wynton and Branford Marsalis for sheer quality and musicianship. Subsequent albums would grow with elegance and fluidity that would have made it extremely hard for you to believe that he could make bad record. Well, he hasn't. The next 11 albums all stand up well on repeated listens. It's very had to find one place to start if you haven't listened to Joshua Redman before. Which is actually a good thing. Take your pick. Most of the albums are still available at good record stores and online. The most recent, Compass (Nonesuch) is a real treat. 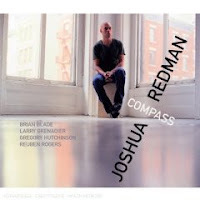 Compass is a double trio session that sees Redman and his band in deep self reflective mode. The music breathes, but with a tension quality that underlies the passion of the performances. All the material on Compass was written by Redman and members of the band. This is one my many favourites of Joshua Redman's in the last few years and will be one of my top albums of the year. Its definitely a good jumping on point if you aren't familiar with him. Once you've tried out Compass you might want to check out the live album Spirit Of The Moment (WB) which was recorded at the legendary Village Vanguard and is a smokin' double set worth your investment.